Another Quintin Barry book from Helion&Company, and again it is an excellent one. 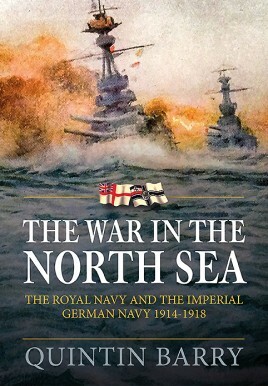 This follows all of the history of the war in the North sea during WWI. Of course, Jutland is there, but it is by no means the only subject covered. It is also full of pictures of the ships and men that made up the British and German forces. The book is not sparing on maps either, so that you can easily follow the book through all of the engagements and the background history of them. The book starts with a history of the British strategic planning. This is mostly a discussion of what type of a blockade the British would use, a close one or a wide one. A close one would have afforded the German navy many more engagements to try and pare the Royal Navy down. By choosing a wide blockade and doing sweeps with larger forces, the chance of the German Imperial Navy to pounce on small groups of the British Navy and even up the odds were much more distant. The author continues with a look back on the birth and growth of the German High Seas Fleet. Mr. Barry then starts to describe the various encounters between the two combatants, starting with Heligoland Bight and on to Dogger Bank. Jutland, as is natural, takes up a good amount of the author's writing. He goes deeply into the reasons for the battle and the actual history of the gigantic clash. Then he presents both sides of the British arguments about who did what, and when, during the battle and if it was the correct move for that admiral to take. There has been a hundred year fight going on between the proponents of Jellicoe and Beatty. Each side believes that his admiral was correct in his actions and that the other was wrong. It also boils over into whether Jellicoe was too timid during the engagement. Mr. Barry shows that some of the recollections of Beatty and his actual statements at times are not in fact what actually happened historically. Beatty, by virtually forgetting about the tremendously powerful Fifth battle squadron of fast battleships, himself lost a good chance to do some damage to the German High Seas Fleet. Jellicoe who was once described as the "man who could lose the war in an afternoon", is usually shown in books to be very afraid of torpedo and mine attacks on his fleet. This book shows that every action Jellicoe took that day was already discussed with the Admiralty. One example in particular was turning away his fleet from a torpedo attack. Torpedoes were still in their infancy, but a few lucky hits might have made all the difference. As far as to who 'won' Jutland the author does not feel that it was unequivocally a British victory. There are many pros and cons to each side of the argument, and the author shows them in all of their facets. Mr. Barry also puts paid the untruths that the German High Seas Fleet never sortied again, and actually did attempt a few major sorties after Jutland. The book continues to describe the submarine threat against both naval and merchant navies. He also delves into the fledgling naval aviation with descriptions of the Zeppelin and aircraft and their uses in the North sea. The Germans felt that their Zeppelins would really give them an edge in fighting the British Navy. It was to be a misplaced hope.